“If Yan can cook so can you!” For those of you who grew up with the Yan Can Cook show, you know what I mean. Growing up, my grandmother tuned into his show on PBS every single day to watch him cook delicious Chinese dishes and entertain us with his incredible chopping skills. Martin Yan was so entertaining and engaging … we were addicted! When Chef Martin Yan opened his Chinese restaurant, M.Y. China, we knew we had to visit. Yesterday, M.Y. 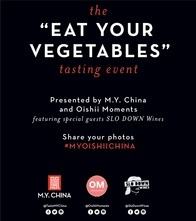 China and Oishii Moments partnered to bring you “The Eat Your Vegetables Tasting Event,” celebrating the launch of M.Y. China’s vegetarian menu on the most auspicious of days, September 9th, California’s 165th birthday! The happy hour event was held from 4:00 pm to 6:00 pm at M.Y. China in the Westfield San Francisco Centre). Thank you everyone who joined us last night at M.Y. China! We had a blast and hope you did as well. The pre-launch of their vegetarian dishes was amazing… and everyone really enjoyed the wines from SLO Down Wines as well! Our giveaway winners part 1, part 2 & part 3 were able to enjoy complimentary samplings from M.Y. China’s latest and greatest vegetarian menu along with 3 delectable vintages from SLO Down Wines. Take in the beautiful decor and the vibrant flavors as you savor the most luxurious and talked about Chinese food in San Francisco. Guests mix and mingled with other foodies, met the M.Y. China staff, Brandon Allen (owner of SLO Down Wines) and yours truly, Mindy and Troy from Oishii Moments. East meets West at M.Y. China, San Francisco, where the most tastefully prepared greens and delectable fruit of the vine join together to celebrate the spirit of California. M.Y. China’s bold new vegetarian collection will make your palette say, “xie xie!” (“thank you” in Chinese). Your inner foodie will be in heaven as you taste dishes from one of San Francisco’s most talented chefs. M.Y. China served their vegetarian dishes on eco-friendly, compostable, biodegradable, disposable plates and utensils. Loving them even more! Brandon Allen, the owner of SLO Down Wines, gleefully pourined his vintage grape! In celebration of the “Eat Your Vegetables” tasting event. SLO Down Wines & Oishii Moments proudly offers 20% off your entire order on www.slodownwines.com/shop. Use online promo code OISHII20at checkout. Congratulations to Serena Yuen (@serwennie) for winning the “Eat Your Vegetables” grand prize of a $100 M.Y. China gift card + Martin Yan’s China Cookbook (signed by Martin himself) + 2 bottles of SLO Down Wine. Sep 9 (CLOSED) Instagram Loop Giveaway: Happy 164th birthday, California!